Football was the last substantial contributing factor to undergraduate (and alumni) life. The football team was an enormous attraction to students, alumni, and Philadelphians alike. 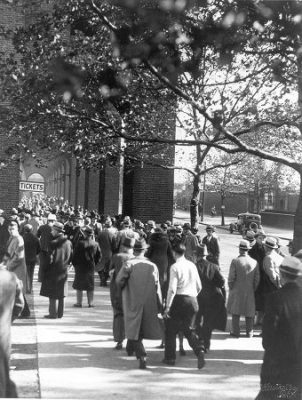 In 1938-1942 Penn drew more people to Quakers games than any other university in the country, with 1,780,500 observers in those four years. It is very easy to see how this legacy was born. Penn’s football distinction began in the mid 1890s, when a former Eli athlete named George Woodruff became the football coach of the University. From 1894-1898 Penn’s record was 67-2. In 1917, when Penn went to the Rose Bowl (and lost), they also had one of the largest stadiums in the country. Perhaps just as important as the legacy of Penn’s great record on the field was its great record off the field, the financial record, that is. Athletics was a big source of business at Penn during the first 40 years of the 20th century. From the birth of football at Penn to the year 1917, the Athletic Association of the University presided over all financial matters concerning athletics at Penn. The Athletic Association was made up of well-heeled alumni who would support activities in order to elevate Penn’s athletic program. When the Association was forced to resign in 1917 the University Council on Athletics was formed and the Trustees took over all athletic affairs. In addition to consuming a large amount of money, athletics contributed lots of money as well. In 1896, 15% of the annual revenue generated derived from intercollegiate athletics. In 1930, Athletics still accounted for 11% of the annual income generating over 1 million dollars. By this time it would be hard to overcome high-powered football at an institution like Penn, even if anyone wanted to. But as it turned out, somebody did. President Thomas S. Gates, the inventor of the “Gates Plan,” of 1931 (which was an attempt to end the hypocrisy of Penn’s athletic program and its accompanying, fraudulent role as an “Ivy League,” academic university), tried to bring Penn back to a more robust intellectual foundation. He accomplished this (briefly) by diminishing programs and trying to extricate the University from “big-time” athletics as much as possible. Gates did this by budgeting athletics, making all coaches part of the faculty, thereby decreasing their salaries and demanding them to teach classes if they wished to remain at Penn (most did not). Thus, he had hoped would bring back a more serious academic reputation to Penn. Gates’ “Ivy League” constituents agreed and in 1933 added themselves to Penn’s football roster for the first time since 1921. Unfortunately, the University could not keep up this sincere policy for long and by the thirties they were openly recruiting again. By 1945, the “Ivy Leaguers” had had enough of the pretense and double-talk and called the Ivy Group Agreement of 1945. This “agreement” was an explicit reiteration of the once tacit athletic statutes of the so-called “Ivy League” (which was unofficial at the time). The agreement prohibited recruiting and training camps among the eight schools involved. Those measures definitely hurt Penn as a football power but would improve Penn’s overall university standing in the long run. Even so, by 1945, Penn’s football/financial legacy was disappearing rapidly as it had not exceeded 5.5% of the annual revenue of Penn in a decade of fiscal years. Fortunately, the aforesaid agreement would allow a bond providing financial benefits that replaced and exceeded those of sports. After the retirement of President Gates in 1946, the University sought a new president and in 1948 hired Harold E. Stassen. Stassen was the former governor of Minnesota and future presidential candidate. His main purpose as a president was to relieve Penn of the substantial debts they had accumulated from athletics: a 1.6 million dollar mortgage on the Palestra and Franklin Field, as well as a $200,000 deficit from “minor sports”. Stassen had a method by which to carry out his “plan”-it was called “Victory With Honor” which he announced on March 9, 1950. Essentially the “Victory With Honor” plan was a statement that Penn would adhere to the NCAA rules of recruitment and practices (without any mention of the unofficial Ivy regulations discussed five years before) and maintain its challenging schedule against opponents such as Virginia, Army, Navy, and Notre Dame. Stassen implemented a nine game season instead of eight, with latitude to take long away game trips to places like California. His plans relied on the appointment of Franny Murray, a member of the “Destiny Backfield,” as Athletic Director at Penn. Murray was hired with the expectation that he would be dedicated to the football squad’s interests. Even with all the exaggerated publicity around this new plan, it was probably only a bit of a diversion for the alumni and fans because by this time it was clear to the administration that sports debts could not be cured by more sports (although that was the plan which was publicized at the time). In other words, ticket sales were no longer a substantial source of funding for the University of Pennsylvania. But with the advent of World War II, something far more financially and academically significant could take the place of sports at Penn. But the finessing and insinuation of this pecuniary and fragile issue had to occur in such a way so as not to upset the alumni and fans of the Quakers sports teams. The alumni had always been fervent supporters of the football team; when they were informed of Stassen’s much publicized plans for rebuilding through football, they were inevitably thrilled. Unfortunately for the alumni and fans, the Ivy League had only just met to discuss de-emphasizing and reforming big-time Ivy League football in 1945. This fact coupled with the reality that in 1948 Penn lost their golden-boy (and NFL-bound) Chuck “The Rock” Bednarik, who was the last player to play defense and offense. The year after Penn lost 22 of its Senior players to graduation. In 1948, even with the new nine game schedule and challenging opponents, attendance at Franklin Field began to decline steadily (1948- 432,330 compared to 1949- 380,424 in attendance ). Some of the alumni began to share an uneasy air about the team and their outlet for this anxiety was the alumni magazine, Pennsylvania Gazette. In 1949, as a disappointing season began to unfold, the Gazette was also a source of criticism of the team and administration. Many alumni, after witnessing the sinking fortunes of football at Penn, wrote to the Pennsylvania Gazette and complained, “we can expect not to hear about students enrolling at colleges because of the educational advantages.” This kind of naivete about the current financial markets for renowned universities was common among the alumni and many such letters surfaced through the Gazette. 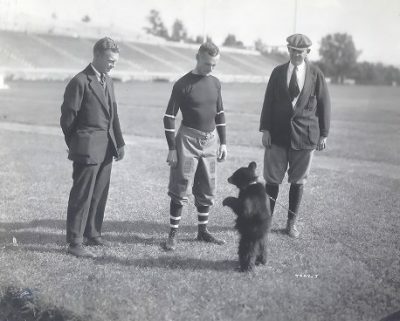 Some of the alumni, who were more devoted to scholarly images at Penn, also expressed their opinions in the Gazette and were equally dismayed that Penn was even attempting to play such challenging teams in football, for fear of losing face in the coveted “Ivy League”. they [Notre Dame] are not fit rivals . . .we are of the Ivy League . . . can we not seek intersectional rivalry with institutions whose atmosphere football-wise is more similar to the Ivy League? . . . Football is a severe taskmaster under today’s conditions, and might prove to be a heavy straw indeed on the backs of our athletes, who must look to the main purpose for their matriculation at an institution of higher learning.